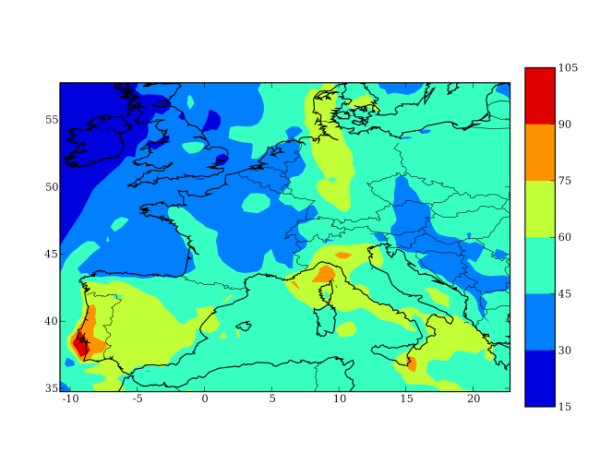 The goal of the following test case is to reproduce Chimere test case for the 2003 Heat Wave in Europe. You must have already downloaded and installed Polyphemus to have this test case working. Below, [version] will stand for 1.8.1 but this test case works also with versions 1.8, 1.7.x, 1.6, 1.5, 1.4, 1.3.x or 1.2.x. a directory raw_data/, with data necessary for preprocessing. a directory data/, with all data precomputed. It also contains the results of preprocessing. a directory config/, with all configuration files used. a directory results/ where the results are stored. a program, called sum-emissions.py, and its configuration file (sum-emissions.cfg), used to sum biogenic and anthropogenic emissions. a file version stating for what version of Polyphemus the test-case was made. The file config/general.cfg is used by all preprocessing programs and as such must be the first file you modify when performing preprocessing. Make sure to modify and use the file provided in the directory TestCase/config/ . You should only need to replace the value of Programs to have the path to preprocesing in the last version of Polyphemus compatible with the test-case you have. The domain is defined for a simulation over Europe. Make sure that the date is 2003-07-30. A python program is provided among the preprocessing programs to generate land data from Chimere raw data. Files LANDPAR and LANDUSE_CONT3 from Chimere V200606B are necessary to generate land data. They have been included in the archive. This creates two files (LUC.bin and Roughness.bin) in data/ground/. Download the meteorological file for Chimere test-case and put it in raw_data, then extract it. After you have done so, execute MM5-meteo-castor to process the MM5 file you have downloaded. Memory allocation for grids... done. Memory allocation for output data fields... done. Conversion from sigma levels to altitudes... done. Converting from latlon to MM5 indices... done. This creates 18 binary files in data/meteo/. This creates a directory raw_data/AemiCONT3-200311/. Here the command line has been divided in two by "\" for clarity reason but it should be typed as one line. We use utility program call_dates because chimere_to_castor can only be launched for one day at a time. Again, the first line has been divided with "\" for clarity reasons. The program creates 20 binary files in data/emissions/. Biogenic emissions are generated from meteorological data, using program bio-castor. This creates three binary files in data/bio: Isoprene.bin, NO.bin and Terpenes.bin. Summing anthropogenic and biogenic emissions. Computing total emissions for NO. Computing total emissions for C5H8. Computing total emissions for APINEN. This creates three binary files in data/emissions: APINEN-total.bin, C5H8-total.bin and NO-total.bin. Memory allocation for data fields... done. This computes deposition velocities for 23 species. Download and put in raw_data/ the INCA files from Chimere test-case. This creates a data directory named raw_data/INCA. # Configuration file for inca boundary conditions. As the simulation is set in July and August 2003, launch the program again using INCA.08 this time and 78 (hourly) time steps in August. You will obtain boundary conditions for 14 species. You should check and modify config/castor.cfg if necessary. You have to check the paths (in particular check that the data and saver file are config/castor-data.cfg and config/castor-saver.cfg) and to make sure that the date for the simulation is 2003-07-30 (date from which the preprocessing starts). Read(ifstream& FileStream, Array<TA, N>& A). Indeed, input data can be computed for several days, so the program will discard the data for the days between Date_min in a section of polair3d-data and Date_min for the simulation. Also remember that volume emissions given for NO, APINEN and C5H8 are the sum of anthropogenic and biogenic emissions. To visualize results you have to put the path to Polyphemus/include in your PYTHONPATH. For instance, for Bash users add export PYTHONPATH=$PYTHONPATH:~/Polyphemus/include to your .bashrc. Then go the directory results/ and launch IPython.